The haunted eyes of pararescueman Hugh Franco should have been her first clue that deep pain roiled beneath the surface. But if Amelia couldn't see the damage, how could she be expected to know he'd break her heart? Amelia Bailey's not the kind of girl who usually needs rescuing...but there are anything but usual circumstances. USA Today bestselling author Catherine Mann delivers another hero from the Air Force's celebrated Pararescue Jumpers–"The PJs"– an ultra-elite force who put themselves at extreme risk in the most dangerous emergancies so that others may live. 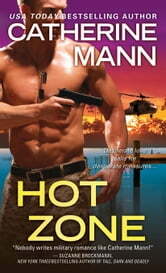 A sizzling thrill-rise of action and attraction, Hot Zone will leave your pulse pounding.